The collaborative relationship between Andy Warhol and Jean-Michael Basquiat developed in the 1980s after they were introduced to each other by art dealer Bruno Bischofberger. This relationship – both personal and professional, the good and the bad – was detailed in The Andy Warhol Diaries. Beginning in 1976, Andy Warhol began calling his assistant, Pat Hackett, every morning at 9am to rehash the previous evening’s goings-on. Warhol name-dropped on the regular – no one was off limits and he could be quite cutting and catty in his offhand remarks about his contemporaries. He gossiped about Liza Minnelli and Mikhail Baryshnikov doing cocaine, “just shoveling it in,” and opined about Salvador Dali’s latest work (“He is smart.”). After Warhol finished detailing his night to Pat (which could often take up to 2 hours a day! ), she would hang up and immediately transcribe her conversation with Warhol. They upheld this funny little tradition for many years though it wasn’t until 1989, two years after Warhol’s death, that she was able to edit down the over 20,000 pages of daily correspondence into the now-celebrated 800 page tome, The Andy Warhol Diaries. Looking back on that initial meeting in October 1982, it is easy to begin tracing the collaborative lines between the artists that finally gained momentum in 1984 and lasted off and on through until 1987 when Andy passed away. Basquiat admired Warhol tremendously and wanted badly for the more established artist to validate his own art. Bischofberger forced this relationship a bit when, in 1984, he initiated what amounted to a Brotherhood of the Traveling Canvas between Basquiat, Warhol and Italian artist Francesco Clemente. The rules were simple: each artist was to begin three separate paintings and one drawing each. They’d leave enough “mental and physical space” (Bischofberger’s words) for the other artists to contribute to the painting. They’d then send their unfinished work on to the next artist kind of like the stories you’d write with your friends where someone would begin with a paragraph – sometimes stopping mid sentence – and the next person would begin to tell their own story, apropos of nothing but their own imagination. The three artists continued this experiment between them for about a year but in late 1984 Warhol and Basquiat began secretly collaborating on their own, thereby leaving Clemente out of the club for good. During the Warhol-Basquiat collaborations, Warhol would usually be the one to (unsurprisingly) begin the painting. He’d often silkscreen a recognizable logo or product – something so typically him – onto a canvas, which Basquiat would promptly write or paint over, leaving his own mark on the work. On Tuesday, April 17, Warhol mentioned in his diary “[Jean Michael] came up and painted over a painting that I did, and I don’t know if it got better or not”. Olympic Rings, Acrylic and silkscreen on canvas, 81×183.5”, 1984-5, is one of the most harmonious examples of these collaborative efforts. Andy’s giant Olympic rings – perfectly Warholian in their zeigeist-y nature, are given up to Basquiat’s crude, unsettling faces baring garish grins and red eyes. The work is subversive, of-the-moment and bold. So too is Collaboration (Dollar Sign, Don’t Tread On Me), oil stick, acrylic and silkscreen on linen canvas, 20×16”, 1984-1985. The silk-screened dollar sign is quintessential Warhol. Basquiat’s “Don’t Tread On Me” hanging snake immediately nullifies Warhol’s celebration of Capitalism and creates something more sinister, less playful. This play of opposites is what makes the pair’s collaborations so successful. There’s no need to compete because each artist is offering something uniquely their own. 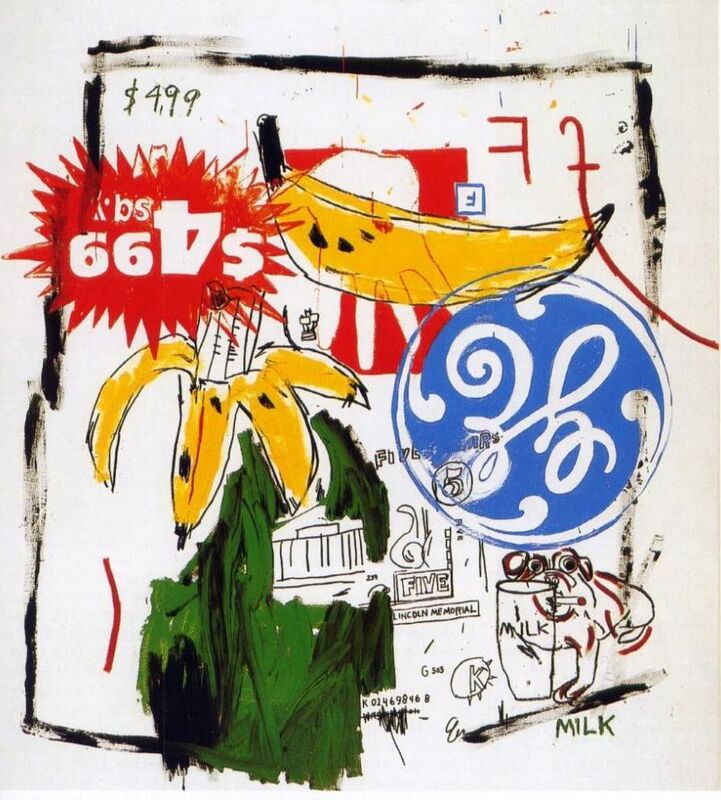 Untitled, (General Electric II), acrylic, oil stick and silkscreen ink on canvas, 85.75×68.8”, 1984-5 and Bananas, acrylic and oil stick on canvas, 88×81”, 1984-5 are two other examples of the playful combined inspiration. Unfortunately, the grand experiment ended not in celebration but with the artists barely speaking. Their relationship became increasingly strained as their partnership wore on and all but ended in September 1985, when “Warhol and Basquiat: Paintings” opened at the Tony Shafrazi Gallery in Soho to mostly negative reviews. Warhol’s death in 1987 deeply affected Basquiat and drove him further into the dark world of drugs that ultimately cost him his life. Hackett, Pat. The Andy Warhol Diaries. Warner Books. 1989.